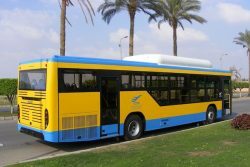 The Cairo Transportation Authority (CTA) has ordered 122 MAN natural gas buses, of which the first two were delivered at the end of last year. Natural gas city buses from MAN are especially environmentally friendly and economically attractive – two important reasons why CTA made their selection. 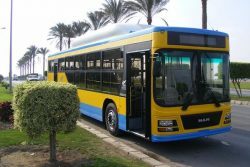 The Compressed Natural Gas (CNG)-powered buses were produced in cooperation with the local importer, Kastour Egypt for Industry & Trading. The delivery of 60 vehicles is planned for July 2019, and the last units are to be handed over in the first quarter of 2020. The city buses are based around a MAN type A69 chassis. The two-axle low-entry chassis is driven by a gas engine with 310 hp (228 kW) and meets the EEV emission standard. Passengers can choose from 33 seats and 67 standing places. CTA was also particularly concerned with the issue of safety, and various assistance systems, such as the electronic brake system (EBS), meet this need. The buses have also been equipped with disc brakes and an automatic fire-extinguishing system in the engine compartment, among other things. “The Kastour Egypt for Industry & Trading production facilities in Cairo have been producing bodies for MAN trucks and buses for over 23 years. The current CTA order – which we are very pleased about – also illustrates the excellent cooperation between MAN and its local partners,” says Adel Lünz.